Our most popular cake recipe from Riverford's legendary pumpkin day! 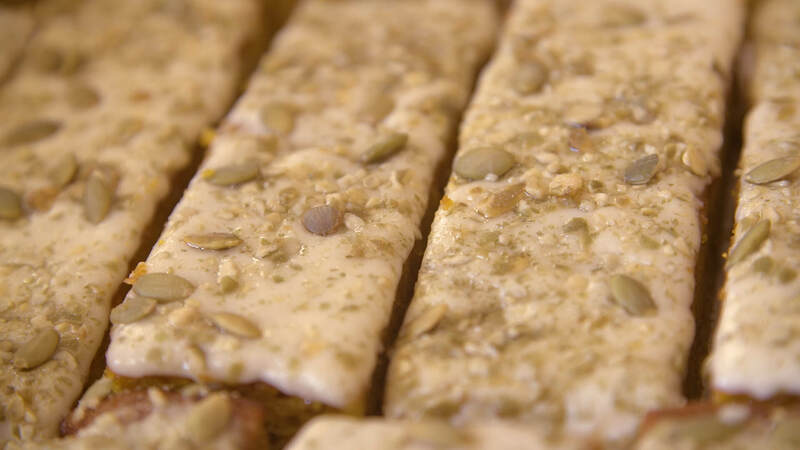 If you like carrot cake, then you'll love our squash traybake. Try using up your leftover pumpkin/squash in this Autumnal traybake. Heat oven to 180C/fan 160C/gas mark 4. Butter and line a 30 x 20cm baking or small roasting tin with baking parchment. Put the flour, spice, bicarb of soda, pumpkin seeds and salt into a large bowl and stir to combine. Beat the eggs with the sugar till fluffy then mix with the dry ingredients till combined. Blitz the squash in a food processor until a puree. Stir the squash puree into the batter and then pour the batter into the tin and bake for 30 minutes. To make the glaze, beat together the icing sugar, water and olive oil till smooth then set aside. When cake is done, turn onto a cooling rack and allow to cool completely. Once cool, spread the glaze over the cake and sprinkle the pumpkin seeds over the top to finish.